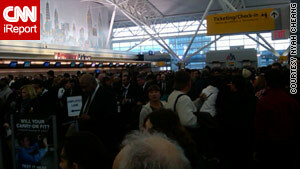 An iReport photo shows crowds at New York's John F. Kennedy airport. New York (CNN) -- A Brooklyn man faces a trespassing charge after allegedly causing a security breach at New York's John F. Kennedy International Airport on Saturday. The incident prompted authorities to evacuate a terminal, disrupted travel, and delayed hundreds of passengers. Jules Paul Bouloute, 57, was arrested at his home late Saturday and is being charged with criminal trespass, Port Authority spokesman Steve Coleman told CNN. Bouloute was returning from earthquake-ravaged Haiti. He had taken a connecting flight to JFK from Orlando, Florida. The Transportation Security Administration said the breach occurred at about 3:30 p.m. when an individual entered the secure "sterile" area in Terminal 8 through a nonpublic, employee door used by the airlines. The breach forced authorities to evacuate the terminal and rescreen passengers. By 6 p.m., authorities had finished the rescreening and had opened the terminal, Coleman said. Security cameras captured the person's image, Coleman said. Earlier this month, a man was charged with trespassing after allegedly breaching security at Newark Liberty International Airport in New Jersey. In that incident, Haison Jiang, 28, of Piscataway, New Jersey, faces a charge of defiant trespass after allegedly ducking under a rope and walking the wrong way through security to greet a woman. The incident shut down Terminal C for hours and forced the rescreening of thousands of passengers.